Gulf Craft delivered the third vessel in bow thrusters each outputting 200 hp. Built to an Incat Crowther design, Libby Class 2 capability. ABS +A1 HSC Crewboat Restrcited Ser- conversion, including the in- keeping and dockside maneuverability is to provide safe boarding means to both vice OE +AMS +DPS-2 Fif Capable stallation of new cargo holds, enabled by three Thrustmaster 30TT200 crew and passengers. trunk deck and bow, and a new cargo unloading system. It will operate as an ATB. January 22, 2019. The investment included the and control technology, soft- complete rebuilding of the site’s existing pro- duction hall, along with the building of a new, ware and expertise for devel- 35m high hall with 40t, 80t and 200t lift capaci- opment of the frst complete ties for the manufacturing and testing of thruster systems that are now in units in all size ranges. operation. A renewed welding hall, six factory acceptance test (FAT) rigs, an integrated logistics center and a main ofce complex also formed part of the extensive work scope. 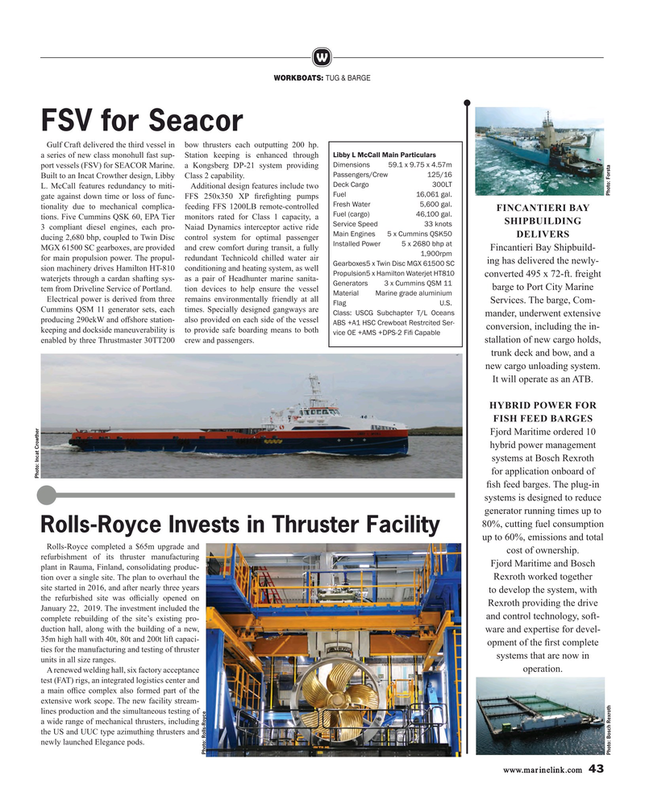 The new facility stream- lines production and the simultaneous testing of a wide range of mechanical thrusters, including the US and UUC type azimuthing thrusters and newly launched Elegance pods.